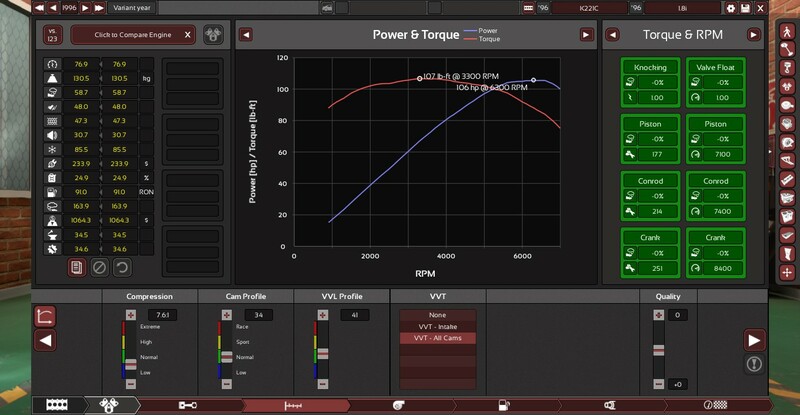 Creating an engine with VVL, then changing the engine block configuration seems to cause the VVL profile slider to get “stuck” on the previous value of the old engine block configuration. For my current example, make an inline 3 with a VVL profile of 41, change the engine to an inline 4, any VVL profile value below 41 does not effect the engine, only values above 41 effect the engine. Oddly, if you just open the engine in the engine designer section of the sandbox, it works fine, but when it is part of a functioning car, it seems to bug out. After putting in a new engine family, the bug seems to defintaly be tied to the model and not the actual engine, as putting in a new engine family, and then adjusting properties of the car(gearing suspension etc.) the VVL becomes stuck at 41 again in this specific instance. This bug wasn’t present in Kee at all, as far as I am aware, and as such I could lower the VVL profile beyond 41 in Kee without any problems at all. However, in UE4, it’s now totally impossible to use a VVL (secondary cam) profile less than 41 - any attempt to do so will cause the VVL profile to default to 41 the next time you open that particular engine, as shown here. It’s particularly annoying when setting a very mild pair of cam profiles for an economy-based engine. So, contrary to what you have pointed out, the bug is actually tied to the engine, and not the car to which it has been assigned - it will always occur even if the engine has not been assigned to a particular car, as evidenced by the blank model and trim names in the screenshot above. Yep, you are correct, im assuming this is a bug and not intended behavior. Most likely a bug that has to do with the default cam profile of 40 and then vvl profile of 60. If its intended as “having a vvl profile below 41 isnt not useful” i disagree. If this has been a UE4 bug for awhile, why has it not been reported? That definitely is a bug but also you should maybe reconsider your design choices if you think a VVL cam of less than 41 is useful xD I guess without the context of the campaign that is a little hard to see for most.